High levels of European military spending played a key role in the unfolding EU debt crisis and continues to undermine efforts to resolve the debt crisis, alleges a new report by Transnational Institute and the Dutch Campaign against the Arms Trade. 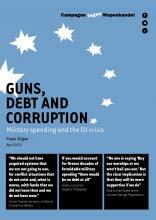 The report, Guns, Debt and Corruption: Military spending and the EU crisis, demonstrates how military budgets across Europe have been largely protected, at a time of severe social cuts. EU’s military expenditure totalled 194 billion euro in 2010, enough to pay off Italy, Greece and Spain’s annual deficit. The latest data released today by the Stockholm International Peace Institute suggests little change in these overall trends. The report unveils how high levels of military spending in countries such as Greece, Cyprus and Spain at the epicentre of the euro crisis played a significant role in their debt crises. Much of the military spending was tied to arms sales by creditor countries like Germany and France. In Portugal and Greece, several major arms deals are being investigated for serious irregularities. Yet creditor countries continue to hawk new arms deals to debtor countries whilst demanding ever more stringent cuts in social services. The report argues that resolving the debt crisis will require cancellation of the debt tied to corrupt arms deals and a redirection of military spending towards social needs. It highlights research that spending on education and mass transit creates double the number of jobs as investments in defence. A report launched in May 2007 by Afri on the eve of the General Election, examines the dramatic changes that have taken place in Irish foreign and defence policy over the past ten years.